Yesterday, I wrote about a number of workarounds to the changing Mac OSX internal color management systems since 10.4.7. I also mis-stated that a new QTR tool would be a replacement printer driver for QTR. It is in fact a new utility that works seamlessly with QTR. QTR remains the print driver. 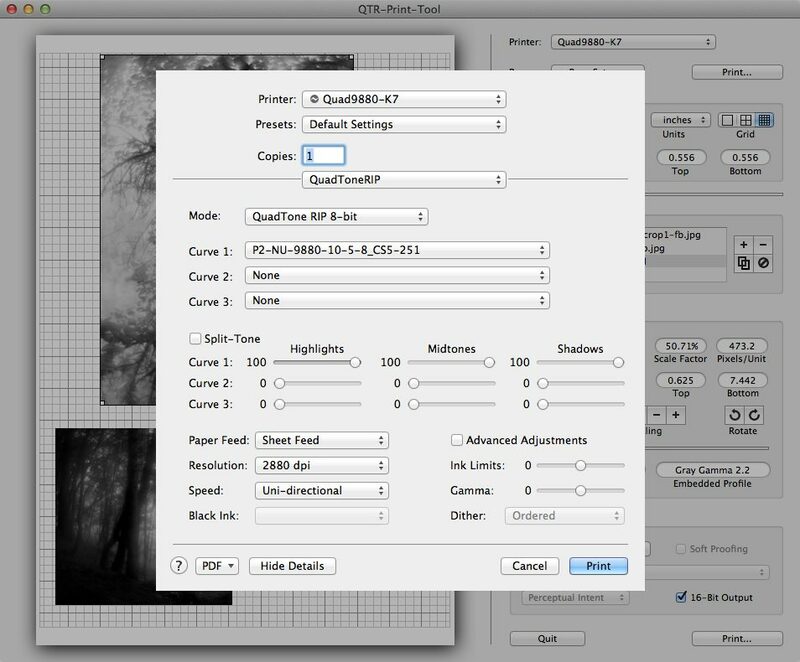 Today, Roy Harrington (author of QuadTone RIP) put up a trial version of the new QuadTone RIP Print Tool for Mac OSX 10.6.8+. This software allows Mac users to print without color management and more importantly, to print without the Mac OSX imposing any color space conversion on a grayscale image. This is critically important because since OSX 10.5, Apple has been producing some form (or another) of internal color space manipulation on files before they are printed. I even went so far as to ask one of the top color management gurus if he had a handle on it that he could share. I figured if anyone would – he would – and he couldn’t. With color files, this manipulation of the image file prior to handing off to the printing system can range from benign to barely noticeable because its RGB to RGB and it’s well organized by Mac OSX. But, with grayscales, any manipulation whatsoever changes linearization. You can not change a shade of gray and expect to print the same shade of gray before it was made lighter or darker. It’s a matter of “simple arithmetic”. Still, Piezography looks extraordinary in the successive versions of the Mac OS. Yet, if perfection is attainable in Windows and just escaping the user in latter versions of OSX – a fix is needed. The workarounds we provided yesterday came after exhaustive research. Clearly we needed some relief in order to move forward with Max OSX. We needed something to stabilize it. Apple certainly can no longer imagine that black and white images are being printed without color inks. When we got to the last version of 10.7 hoping that Apple finally awoke to the needs of “all” of its customers, and we began staring into the face of Mountain Lion, we asked Roy Harrington if there was anything that QTR could offer to side-step Apple’s interference of grayscale images. Roy sent us a new tool to try and it was instantly successful. It makes the latest versions of the Mac OS transparent when it comes to printing. Now Mac and Windows can both print Piezography K7 or K6 curves as they were originally intended to be printed. 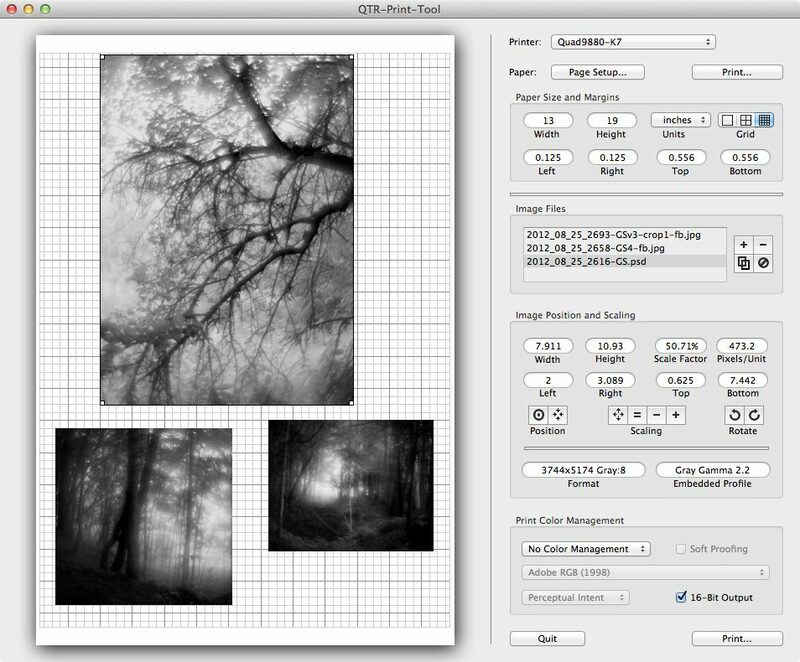 A grayscale image is no longer manipulated by Apple prior to printing when it is printed via the new QTR Print Tool. For us in our own studios at Cone Editions Press, we can finally upgrade from 10.4.7 to anything our hearts desire. But the reality is that professional printing studios do not need to ever be on the latest and greatest. Often, many tools which are best for professionals become obsolete because of a shrinking demand. For example, I still can’t run my Eizo CG displays in 10-14bit with Apple because they only support 8bit graphics. Windows supports Eizos the way they are meant to be used. I must run my IRIS 3047 printer from Windows for Workgroups 3.2 because that is the last version of the ConeTech RIP for IRIS that we produced. When IRIS went out of business in the late 1990s, we no longer were supplying software to every new IRIS 3047 installation destined for fine arts. But, we still use our IRIS Printer at Cone Editions Press. So, I keep an old PC around which uses an ISA slot IKON board adapter to the IRIS, runs the ConeTech color lookup table library from DOS, and an OS9 Mac to run the IRIS Format plugin for Photoshop CS3. So you get the picture of what studios may do to keep superior but obsolete printing tools alive. I would imagine that once you try this new QTR creation, you will want to license it. A lot of work went into it and like everything Roy Harrington does – it is a very high standard product. It has a color capability side to it – but, that’s another story.